Toss the vegetables with the thyme and lemon juice in a large bowl. Set aside. Heat the butter and oil in a large skillet. Add the vegetables and cover. The vegetables should be in a single layer. Cook about 3 minutes or until just beginning to become tender. Uncover and cook, stirring occasionally, until all of the water evaporates and the vegetables are lightly caramelized. Serve hot. Here in the mid-Atlantic we have a much shorter growing season than all of those lucky West Coasters and Southerners. Therefore we have to make the most of what we can get before the date of the first frost. 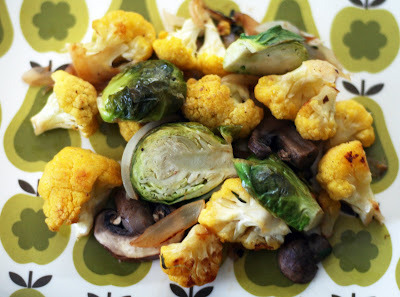 Right now I am seeing some amazing cauliflower and Brussels sprouts so I decided to pair them together in this simple but flavorful saute. I know that cauliflower and Brussels sprouts top many people's least favorite lists but cooked like this, they are amazing. The caramelization process brings out the natural, slightly nutty sweetness in both and completely eliminates any sort of bitterness. I love this as a side dish or as a light meal.